Stocks ended last week on a strong note, regaining a lot of lost ground and giving the S&P 500 its best week of the year. For the week, the S&P 500 gained 3.26%, the Dow grew 3.72%, and the NASDAQ rose 2.61%. Markets started off the week by continuing the previous Friday's rally, buoyed by the expectation that the Federal Reserve won't be raising rates at the October meeting. Are they right? Probably. The chart below shows the results of monthly surveys of professional economists by the Wall Street Journal. Notice how the responses have changed substantially over time. 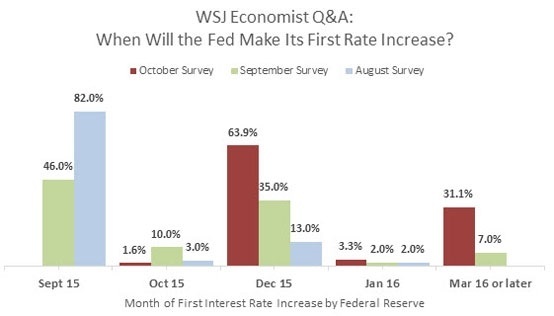 At the beginning of August and September (in blue and green, respectively), the majority of economists believed that a September rate hike was coming. Now in October (in red), bets are on for a December hike, though many believe the Fed might hold off until March or later. Who's right? Who knows. This kind of uncertainty is often what is behind market turbulence. When world-class economists can't agree on even a single data point like a coming interest rate increase, is it any wonder that investors respond nervously? Earning season is already under way, with reports out from 24 S&P 500 companies as of Friday. The season will kick into high gear in the coming weeks, and we expect that to drive a lot of market activity as investors digest corporate profitability. So far, expectations are muted. Total earnings from S&P 500 companies are expected to be down 5.7% from the third quarter of 2014 on lower revenues. The same issues that plagued companies in the first half of the year drove this rocky performance: namely, slowing global growth, a strong U.S. dollar, and weakness in the Energy sector. Analysts know that U.S. companies have been dealing with a challenging business environment but they're hoping for some standout performances. How will markets react to earnings reports? We can't predict anything for sure, but we can expect continued volatility with the major indices bumping up or down depending on how investors are feeling about fourth-quarter prospects. Is it frustrating to be so uncertain heading into the last months of the year? You bet it is. But that's just part and parcel of being an investor in today's markets. One of the (many) reasons you work with a financial professional is so that we can help chart a course through challenging markets. Though indexes and sectors may go up and down, we're always looking for opportunities and individual success stories to help our clients thrive in different market environments. Jobless claims fall again. After an unexpected rise the week before, claims for new unemployment benefits dropped last week to a 42-year low. Though weekly claims can be very volatile, the data points to a strengthening labor market. Chain store sales fall. The latest data from retail chains shows that shoppers cut back on their spending in September. Low sales may bode ill for the holiday shopping season. Consumer borrowing falters. Americans borrowed money from lenders at the slowest rate in August in six months. Though household borrowing still grew, Americans lost their appetite for auto and education lending.